Kulala Wilderness Camp, in the heart of Namibia's Namib Desert, is a 12-bedded camp situated on the 46,000-acre private reserve near Sossusvlei. The camp is about fifteen kilometres from Kulala Desert Lodge, with a separate entrance and access road. It is built at the foot of a mountain facing west with great sunset views. This camp is ideal for groups with their own guide and vehicle, or guests on a self-drive safari. Kulala Wilderness Camp is owned and operated by Wilderness Safaris. Kulala Wilderness Camp commands a panoramic view of the valley and mountains beyond. It consists of 10 simple yet stylish chalets ("kulalas") complete with private verandas, en-suite solar-heated bathrooms and sundecks, all on elevated platforms for that spectacular view. The main area is raised too, built of canvas with thatched roofing and offers a cosy and intimate atmosphere, complete with a bar and traditional three-course dinners. Guests can enjoy drinks, a sparkling pool and a breathtaking view of this area. •	Meru-style tented chalets under thatch. •	En-suite stone bathrooms with showers, flush toilet and hand basins. •	Rooms linked to the main area by gravel pathways. •	Fans in rooms ensure cool breeze. •	Private rooftop area on the bathroom gives guests the opportunity to spend a night under the magnificent skies for which bedrolls are available. •	Soap, shampoo and insect repellent are supplied in each room. •	The main area is build from stout timber and canvas with thatch roofing. •	This main area comprises a dining area, pub and curio shop. •	At night, lanterns light the main area. •	Plunge pool with shaded area. Daily laundry service is included; however, laundry facilities are limited due to a water shortage in the area. Activities are varied and include early morning guided game drives to the spectacular dunes and day trips to the Namib-Naukluft mountains. Game drives and walks are also offered on the private reserve with incredible scenery, desert game and smaller desert-adapted fauna and flora. Spotlit night drives are also a highlight. Early morning hot-air ballooning is another option offered, weather permitting. The balloon safari offers a truly unique experience of soaring silently above the magnificent desert sand dunes and and ending off with a champagne breakfast served at the landing site. This camp caters mainly to the self-drive market, but guided excursions and game drives are offered at additional cost (or included if booked on the Fully Inclusive basis). On the edge of the oldest desert in the world, this is not a game rich area; however, whatever game guests see is interesting and dramatized by the contrast between life and the desert. However, guests will likely see animals like Springbok, Gemsbok (Oryx) and Ostrich who manage to survive in these harsh conditions. Night drives using spotlights offer sightings of Cape Fox, Aardwolf, Blackbacked Jackels, Bat-eared Foxes and even the odd Spotted Hyena. Hartmann's Mountain Zebra may also be seen in the Namib-Naukluft Park. Sossusvlei itself means 'the gathering place of water' in the local Nama language, and, odd as it may seem, in good years seasonal rains in the foothills of the Naukluft and Tsaris Mountains succeed in reaching the vleis, creating temporary lakes that mirror the sand dunes surrounding them. The vleis have evocative names such as Hidden Vlei and Dead Vlei, while the dunes rise up to 300 metres above the valley floor with razor-sharp edges that stand out against the blue sky. Sossusvlei is situated within the Namib Desert which in turn is part of the Namib Naukluft National Park that stretches 400km south of Walvis Bay and is sandwiched between the west coast and the escarpment that runs parallel more than 100km inland. 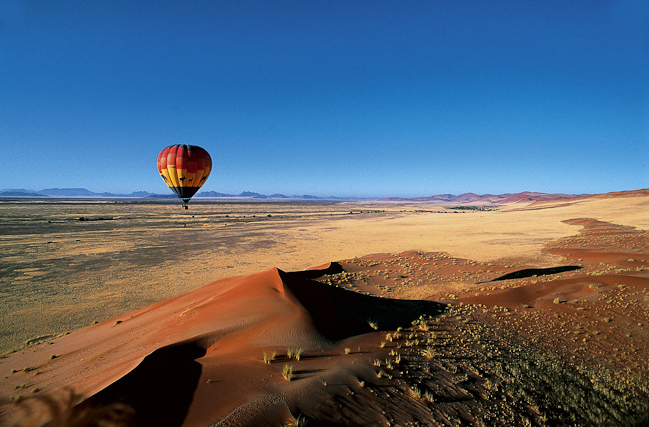 Its huge red dunes and flat valley floors make up the archetypical view of the Namib that is world famous. Desert-adapted wildlife such as ostrich, springbok and gemsbok eke out an existence and are sparsely distributed here. Larger predators include spotted hyaena and occasionally brown hyaena, a mystical shaggy-coated scavenger. Smaller creatures such as bat-eared fox, black-backed jackal, porcupine, cape fox and aardwolf can be seen at night in the cool desert air, and one bird, the aptly named Dune Lark, has its entire global distribution limited to the area, so dependent is it on the area's characteristic sands. Despite the lack of vegetation and low rainfall, a surprisingly diverse array of insects, reptiles and rodents make their home here - surviving thanks in part to the coastal fog that creeps up off the sea each dawn and penetrates up to 50km inland. Anchieta's dune lizard with its peculiar thermoregulatory dance and tenebrionid beetles have all adapted to life here. Nocturnal explorations can reveal dancing white lady spiders and perhaps Grant's golden mole, a Namib Desert endemic.